TotalSim has the ability to test your vehicle at any speed, yaw, ride height, steer and roll to produce a range of results for a realistic analysis of your car or bike. TotalSim can act as a virtual wind tunnel, substantially reducing your development costs. We can test changes for as little as £100 and have the resources to test several hundred modifications in a single week. CFD modelling of the Prodrive MINI WRC car by TotalSim. 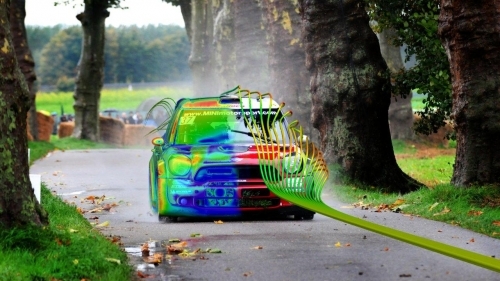 CFD is often refereed to as a virtual wind tunnel, but yet it can provide so much more information than a wind tunnel at a fraction of the cost. CFD can recreate true track conditions, such as cornering and braking attitudes. CFD is repeatable, removing nearly all of the ‘noise’ that plagues full scale testing. Using CFD to test your model will be cheaper and faster than testing in a windtunnel. The highly efficient CFD process, developed by TotalSim, means full car simulation from CAD to first solution can generally be completed in less than a week. Once that baseline has been generated we can turn around hundreds of simulations per week. CFD gets rid of the need to make components every time you want to test a new part. If you want more that just performance prediction then maybe TotalSim can help with a more advanced service, where TotalSim can help lead the aerodynamic development of your car.